From Crawford County, he enlisted 27 May 1861 in Company E (the Crawford County Grays), 6th Georgia Infantry. The roll for 30 April 1864, the last on file, shows him present, with no later record. 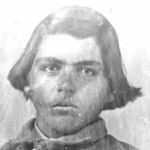 He was probably captured in action in May 1864 and held at Elmira, NY, from which he was paroled, date not given. He was a farmer in Crawford County, GA. Basic information from Henderson's Roster of Confederate Soldiers of Georgia 1861-1865 (Vol. 1, 1959), transcribed by Fincham1. His photograph kindly provided by gggreat-grandson Rudy Rowell, from one posted on Ancestry.com. His gravesite is on Findagrave.